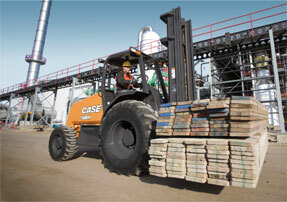 CASE industry leading forklifts come standard with superior power, productivity and comfort. With best in class lifting speeds and zero tail swing design, you can navigate any jobsite. Capable of lifting up to 8,000 lbs, these high performance forklifts raise the bar. CASE forklifts utilize Cooled Exhaust Gas Recirculation (CEGR) technology to offer Tier 4 compliant machines. Exhaust gases are cooled, blended with fresh air and then returned to the cylinder, lowering combustion temperatures and dramatically reducing NOx. Particulate matter is then reduced with a Diesel Particulate Filter (DPF) system, resulting in improved fuel efficiency and reduced downtime.